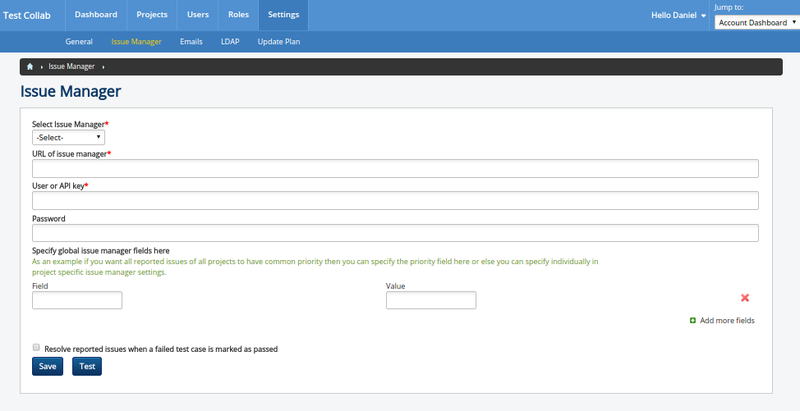 This feature lets the administrator define the application wide configurations for the issue manager association. This will help failure of a test being executed to be reported directly to the issue manager, in a single click. Only one issue manager can be linked to an application at a time. For configuring user should be aware of the URL used by issue manager, credentials - username and password or API key, and fields on the form been used by issue manager to report any new issue (if at all he wants to configure a few of them globally for the application). The details for such field/custom field on "report" issue page, for which user wants a value to be set (and that is going to be static especially through out the application), can be gathered by exploring the source of the page for "Reporting a New Issue". User (used for logging into the issue manager) or API key, (as the case may be) for the specific issue manager, because bug trackers like JIRA and Fogbugz do not provide API keys. If user wants to keep certain fields that will be used while creating issues to have same values across all projects then user should define the same in the section available. For this the user can enter name of the field/custom field on page used for issue reporting and the value that should be assigned to that particular field. User may add as many fields as he wants for the purpose by using "Add more fields" option. The settings can be tested before being saved. When Administrator has opted to test the settings, a separate window will popup where in user will be shown the status of the connection to issue manager. When Connection could be made, then a success message will be shown. 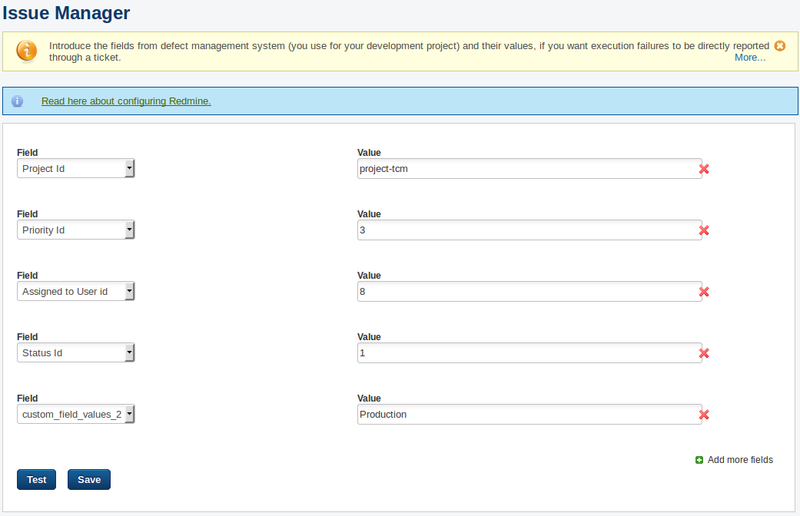 To enable issue manager integration for each project user must fill the project specific issue manager settings form. To do so, user should go to dashboard of the project which he likes to integrate with issue manager. On the form user will have option to select name of the field from the drop down, and the enter/select value that should be assigned to that particular field when a bug is reported. You also now have an option to add a field that is not listed in the drop down provided, for this choose to "Add user-defined-field" from drop down, and enter the name of the field / custom field on page used for issue reporting. Once you focus out of the text box provided to enter the name of user defined field, you get another text box to provide its value. An option to test the configuration before saving the settings is available. When Administrator has opted to test the settings for issue manager, a separate window will popup where in he will be required to confirm that he wants to test the configurations. The title for new (test) issue will be shown. The title can be edited if required. 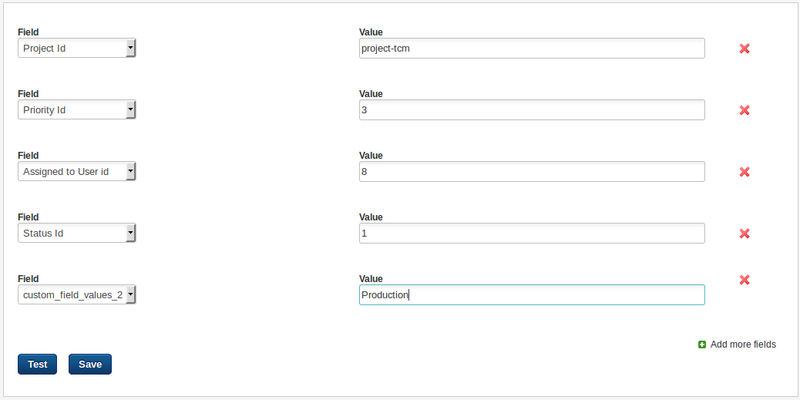 On confirming the operation by clicking the provided button, a new issue will be created; and the title, and the values for fields set during configuration along with their values will be shown. A link to the newly created issue will be available so that the proper functioning can be verified. In TestCollab, it is possible for a user to link his issue manager account with his TestCollab profile, if he wants to be identified as a reporter for the bugs he report during the test executions. See Linking Profile with an Issue Manager for more details on this. Tickets created under the selected issue manager can have links to the attachments that may have been added by tester at the time of test run. 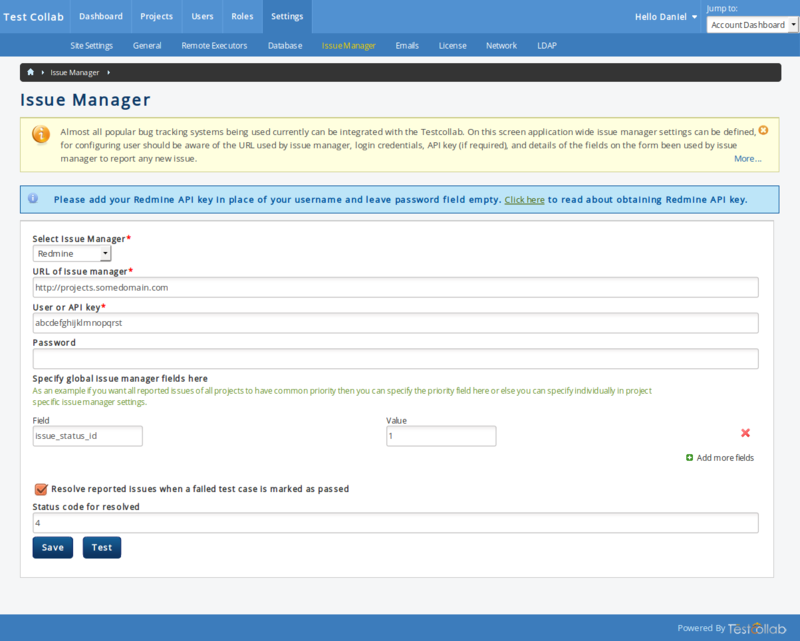 These attachments will always be available for the person who has also logged into the TestCollab application, at the time of using the link, BUT for the person who has not logged into TestCollab, the availability will depend on the accessibility option set by the administrator, under the application's General Settings options. See the related document for details.